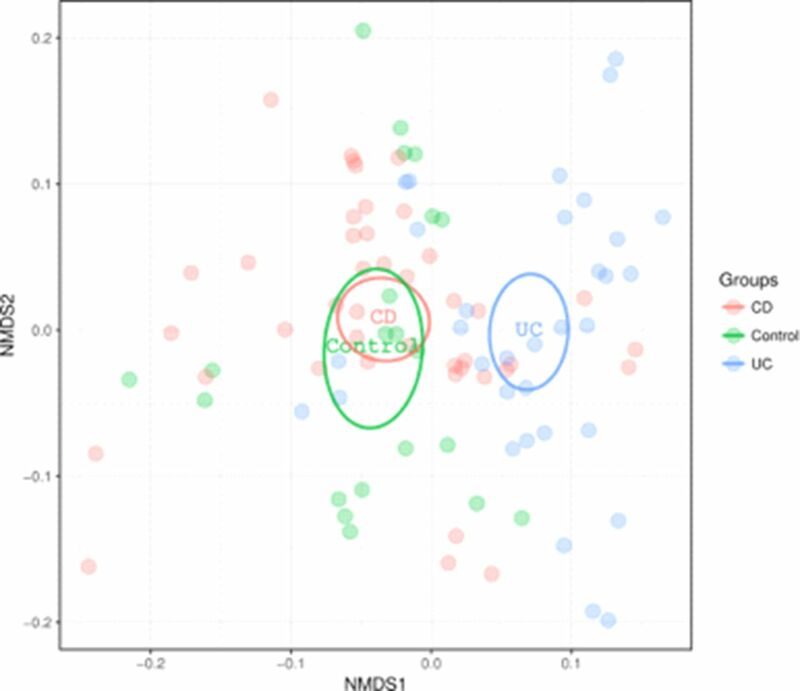 Introduction Crohn’s disease (CD) is associated with a dysbiosis of the bacterial microbiome: few studies have looked at fungi (the mycobiome). Disturbance of Candida and Saccharomyces communities have been found and anti-saccharomyces cerevisiae antibodies (ASCA) may occur in CD. We found fungal metabolites in faeces of CD patients. 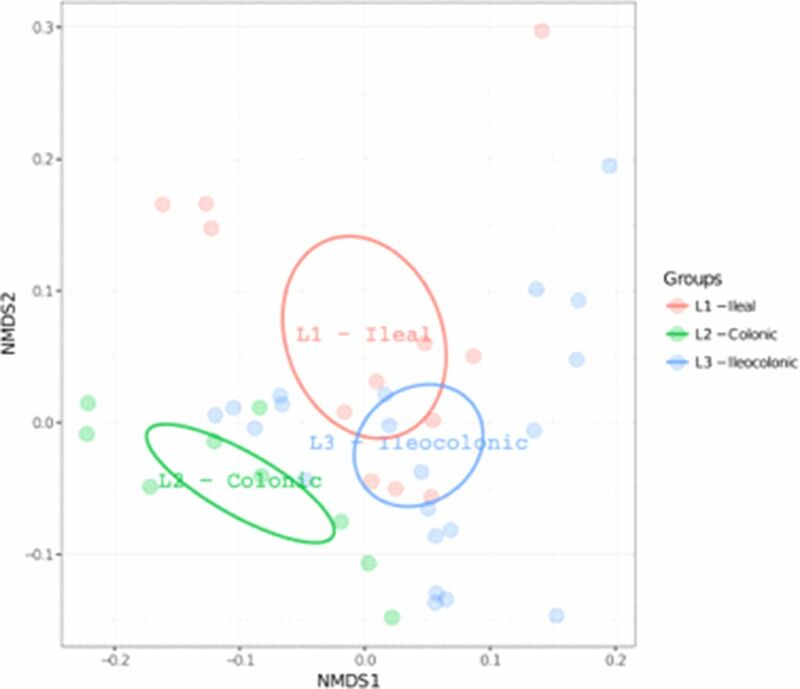 We aimed to characterise the fungal and bacterial communities in the lumen and mucosa in IBD. Methods Faeces was obtained from 63 donors (23 CD, 20 UC, 20 controls). Biopsies from the ileum and colon were obtained from 40 donors (18 CD, 12 UC, 10 controls). Metagenomic DNA was extracted and used for fungal 18S rRNA and bacterial 16S rRNA PCR. Amplicons were sequenced using Illumina MiSeq. Reads were quality filtered, trimmed, paired and OTUs were clustered. OTU table, fasta file, phylogenetic tree and metadata were used for statistical analysis. ASCA and calprotectin were measured by ELISA. 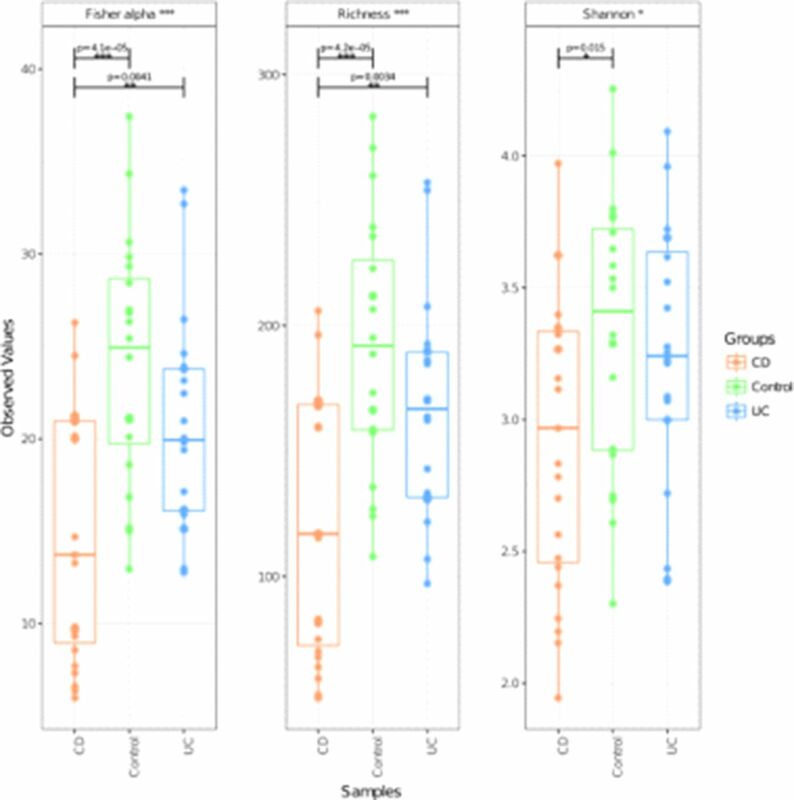 Result The faecal bacterial community is dysbiotic in CD; alpha diversity is low (figure 1), with beta diversity CD samples form a separate cluster (figure 2) and these are more phylogenetically conserved (figure 3). Disease distribution, ASCA and calprotectin explain some of the diversity. The mycobiome does not seem to be different in the faeces in CD and most samples have a high abundance of Saccharomyces. Other yeasts and moulds were also seen. Inter-kingdom co-occurrence network analysis shows few main clusters dominated by Firmicutes, but also Bacteroidetes and Actinobacteria, and two fungi: Malassezia and Aspergillus. The mucosal bacterial community was dysbiotic and influenced by subject, disease distribution (figure 4) and diagnosis (figure 5). In terms of mycobiome, fewer viable reads were obtained, due to limited template. Saccharomyces was the most abundant fungi, but it was absent in some samples, other relevant genera were Malassezia, Cladosporium, Aspergillus and Candida. The last was found more often in controls. 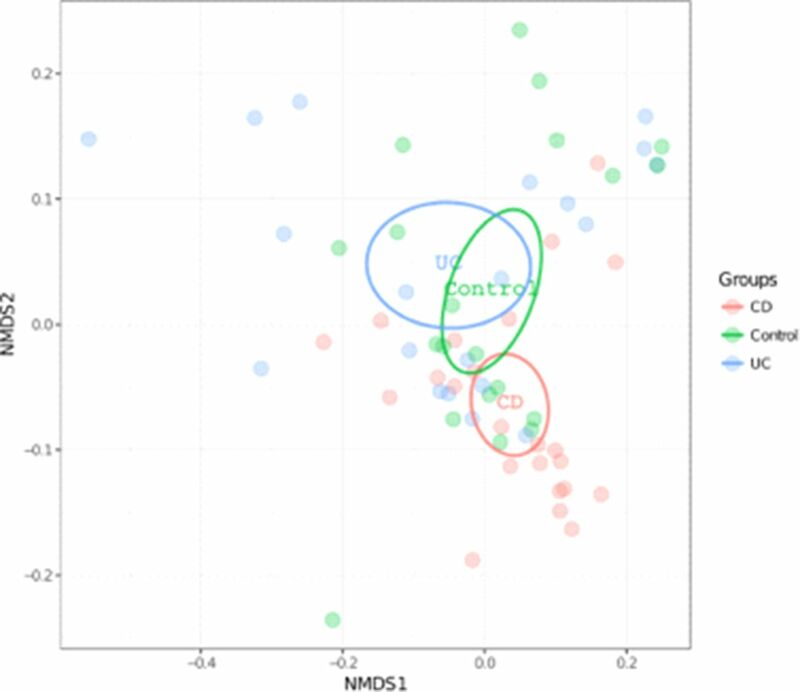 Conclusions CD patients’ bacterial community is dysbiotic but fungi are not. 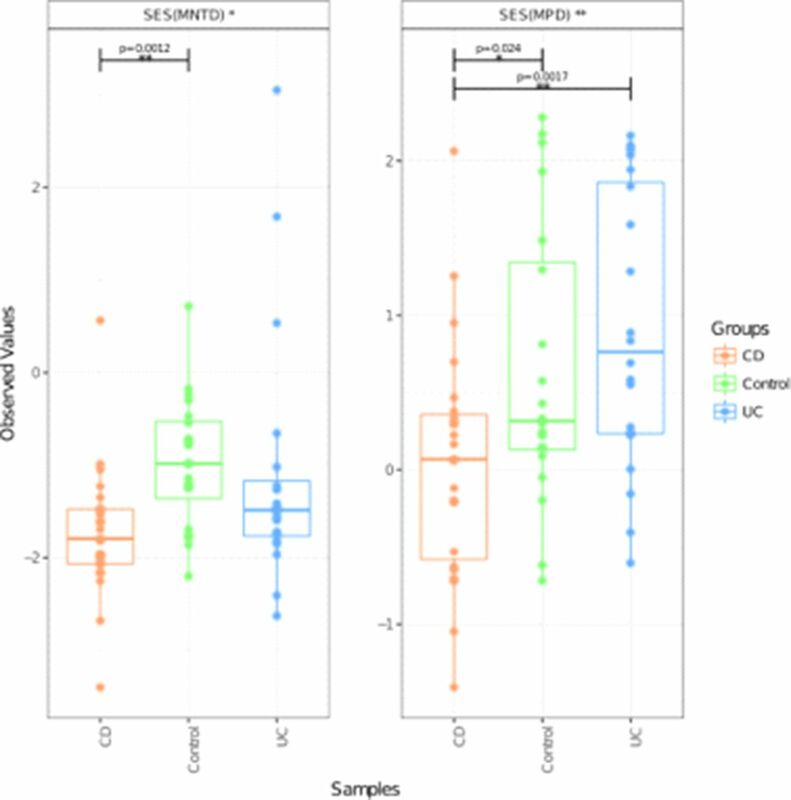 Saccharomyces dominated most of faecal samples, but not biopsies. This implies it may not be a permanent resident of the mucosae. Fungi may arise from food: it is hard to discriminate what comes from food and what is active in the gut. The concept of a resident, symbiotic mycobiome needs further exploration.